I wasnt aware the army act stopped the wearing of any ribbon that isnt being made claim to and have asked my husband who recently completed 26 yrs in the british army and he wasnt aware that the army act 1955 stopped the wearing of ribbons….the act states its an offense to wear AND make claim to…. I dont believe Kitten with her obvious youth would be trying to make claim to, therefore the ARmy act 1955 doesnt really have any relevance. The beautifull kitten worked alongside the Royal Airforce Squadronaires recently at my charity event raising funds for help for heroes…..All these servicemen have served in Afghan and iraq many on more than one occasion and none found her uniform and ribbons offensive i can assure you….. I see someone there is wearing service ribbons. She seems awfully young to have accumulated such things. Is she, perhaps, not the owner of them? Does she know about the Army Act of 1955? The act makes wearing any military decoration, badge, wound stripe or emblem without authority a criminal offence. It’s quite disrespectful to wear such things when you haven’t earned them. Disrespectful to those who went out and fought and earned their ribbons. Hello Bill and thank you for your comment. I understand your concerns completely but would like to assure you that there are no laws against wearing surplus uniform (of which both my military corsets are made from. If you are talking about Act 197 of the Army Act of 1955 ‘Unauthorised use of decorations’ then I will also direct you towards the Stolen Valor Act of 2005 which also states ‘It makes it a federal misdemeanor offense to falsely represent oneself as having received any military decoration or medal.’ With this in mind I can say that although I represent a military pinup of WWII with the correct ribbon medals of the period and wear costumes made from unwearable military garments, it is quite obvious that I have never received these medals and that my outfits are infact steel boned corsets and not official uniform. I am looked upon as a pinup not just of WWII veterans and reenactors but for fighting soldiers of today who all appreciate the effort and detail I go to. I have met a huge amount of WWII veterans and Iraqi veterans or more modern wars who have all complimented my outfits and thanked me for my support. What I do is not disrespectful, I help raise money by performing at charity events for The British Legion and Help for Heroes and those paying guests almost expect me to be in my RAF costume. Are you saying that all of the reenactors I have befriended over these past 11 years are also disrespectful as they too wear the insignia, uniforms and accessories? I am confused as they help keep alive (as I do) an important part of history which needs to be respected. We help educate children and adults alike. 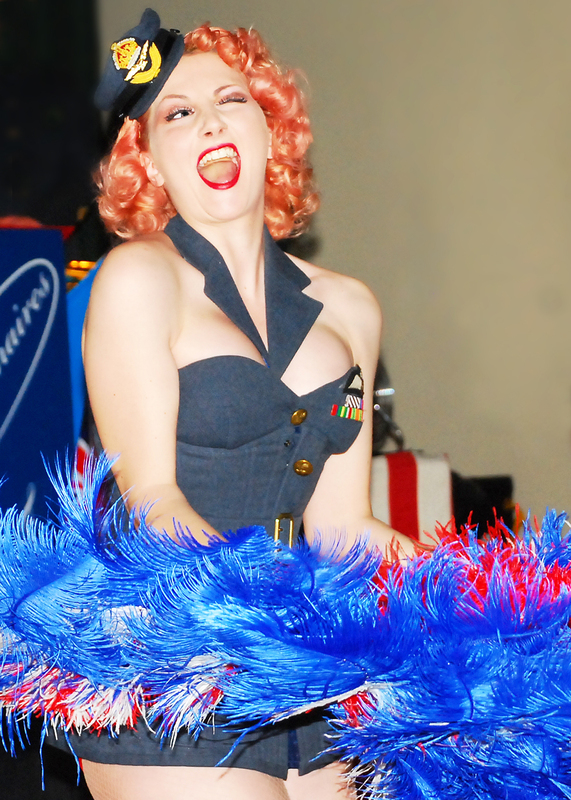 My part is civilian and the ‘lady luck’ pinups that were important to keep up morale. I collect WWII pinup artifacts and have quite a few original photos of female USO entertainers/ burlesque artists dressed in military outfits that have been doctored to become pinup costumes. I represent these and so many other women trying to bring a little joy into soldiers lives. Im sorry you feel so strongly about my outfits. They are all carefully designed and thought out and I am breaking no law by wearing them.